Investment casting (also called lost wax casting) is a multi-step process that delivers accurately cast and economical products. It can be used for low quantity, complex components. 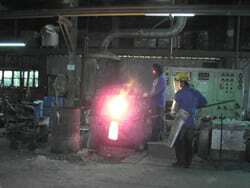 The tooling cost is lower than that of die casting or gravity casting, with the tradeoff in higher part unit cost. The materials used range from aluminum, steel, stainless steel to titanium. For small volume order, we can provide investment casting parts made of aluminum alloys, such as A356T6, A6061, and A514.2 (AC7A). For structural parts, customers can use carbon steels, such as SUS 304, or AISI 4140. The part weight we provide is from 3 g to 5 kg (aluminum).